Glorified accounting. That's basically the premise behind Michael Lewis's 2003 book 'Moneyball' on the use of baseball statistics, which has spawned a Hollywood adaptation. And yet, 'Moneyball' has proved successful both commercially and critically, garnering an impressive six Academy Award nominations, including Best Picture. 'The Social Network' had similarly inauspicious beginnings before translating into one of the finest films of any year, let alone 2010. Perhaps it isn't surprising that Aaron Sorkin, the screenwriter for 'The Social Network', also had a hand in 'Moneyball' - building on an initial script drafted by Steven Zaillian. The success of the script is in forming a film-worthy narrative from Lewis' factual analysis of Billy Beane and his use of sabermetrics in baseball. Much like the book, the film focusses on the Oakland Athletics' 2002 baseball season, in which General Manager Billy Beane (Brad Pitt) battled weakened finances to mould a competitive squad. The film isn't afraid of artistic licence, most notably with the composite character of Peter Brand (Jonah Hill), who becomes Beane's assistant GM after demonstrating sabermetrics. 'Moneyball' goes beyond statistics. It resonates. Occasionally it does so in a cheap manner, shoehorning in a father-daughter sub-plot and overstressing its metaphors, yet above all, this is an underdog story. The Oakland Athletics lose their star players and do not have the finances to replace them. Brand and Beane opt to acquire new players in a radically different manner than their contemporaries are accustomed to. Gone is the traditional art of qualitative evaluation by a scout and instead, it all comes down to the numbers as the duo attempt to find the best value for their money. Hiring unheralded players to replace their departed stars, the method is not well received both internally or externally, and 'Moneyball' is as much a personal battle as it is a wider underdog story. You needn't have a head for numbers or an interest in baseball to find much of 'Moneyball' compelling. Indeed, the manner in which director Bennet Miller and editor Christopher Tellefsen guide the film in the first hour or so is masterful. The film drops off somewhat, reflecting an inherent malaise of the story, yet it still proves largely satisfying. The flurry of Oscar nods seem misplaced, particularly for Jonah Hill and Brad Pitt, neither of whom show quite enough to warrant such recognition. Mychael Danna's evocative score was perhaps more worthy of recognition. 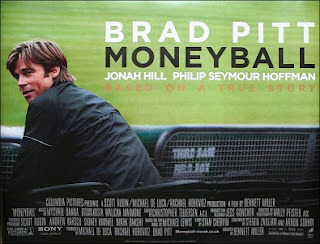 Both Pitt and Hill are more than competent however, and that is the theme of 'Moneyball'. Far from spectacular but plenty interesting. 'Moneyball' is available to purchase at Amazon.co.uk etc.